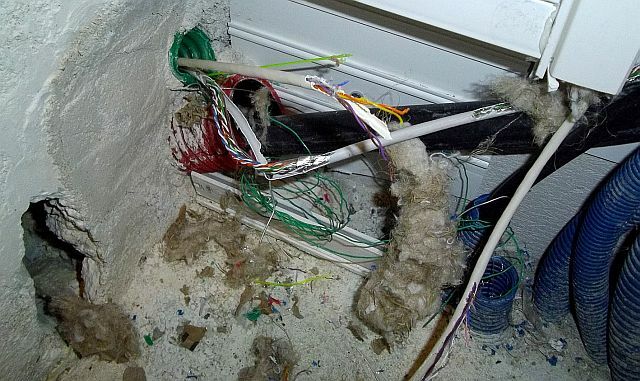 Does your home wiring look like this? Whether its no dial-tone, crackling or buzzing on the line, or you simply need to add a new jack/line somewhere in your house and don't know who to call. Whatever the problem, our experienced line technicans get the job done right, the first time. 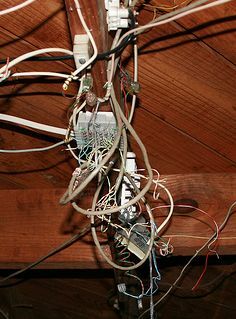 Chances are if your home is over 15 years old its wiring has seen better days. Whether it's due to a shotty installation, water penetration, sun damage, or multiple different technicians touching it over the years, CGI-Communications Technicians can find the damaged line and repair the fault in accordance with todays standards quickly and easily. Common problems you might want to call us for: No Dial-tone, Crackling, Buzzing, Echo, Intermitent Service, Loss of Video, Upgrades, New Jacks, Jack Relocation, and Structured Panels and Racks.